We want to develop a global map of soundscapes and learn more about how people “connect” to their soundscapes. 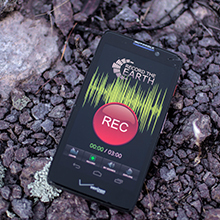 Through a Record the Earth app (for iOS and Android) and an interactive map storing the soundscape archive, we seek the help of citizen scientists to record and upload their soundscape recording to this global archive. We hope to have a variety of events, such as one held on Earth Day each year (April 22), where people around the world upload their soundscapes in order to build an archive of “what the Earth sounds like on one day”. The web site allows users to see a map of soundscapes that “make people happy”. By developing a global map of soundscapes, we hope to document the vast diversity of sounds that occur on Earth. By conducting this each Earth Day, the soundscape archive will serve as a means to determine how these sounds change over time too. Finally, the user “sentiment” survey will assist us in understanding how people relate to the sounds that occur around them.